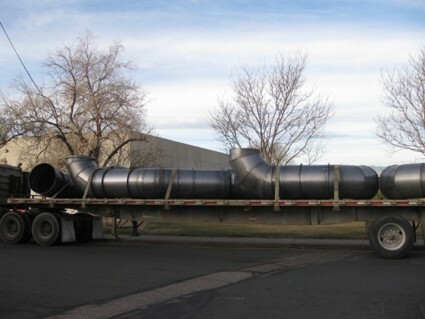 Heavy Ducting For Wind Turbines | Kendo, Inc. 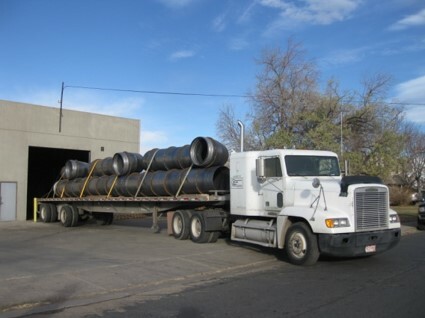 In this application customers contracting for a local wind turbine manufacturer used Kendo to manufacture giant industrial ducting as a part of their manufacturing process. A large part of Kendo’s business comprises doing a portion of the actual project being accomplished in an OEM product. Since we have large rolling capabilities and ability to handle very large equipment, fast turn around, and specialize in one of a kind projects, Kendo is well suited to meet your manufacturing needs. These parts, as shown, are used to redirect the airflow in a windmill from one direction to the other to maximize efficiency. The finished dimensions were 3 feet in diameter x 10 and 20 foot lengths. Q & A inspection included weld testing and structural integrity. Kendo is a reliable source for high quality custom manufactured parts and custom fabrication. For more information about this project or our other value added services please see the table below or contact us directly. Product Description: Used in the manufacture process of making wind turbines for the renewable energy industry. Product Weight: 1400 lbs. ea.